What Clothes Should I Take Camping? Best in Bunch’s favorite hiking and camping clothes. 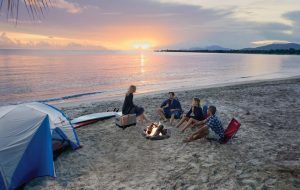 Camping is all about relaxation, appreciating nature and of course, minimalism—minimizing your vacation costs, minimizing your impact and minimizing your load—both physical and emotional, so it might seem counterintuitive to put a lot of thought into what camping outfits you should pack for a weekend trip, but the right hiking clothes—believe it or not—are just important as your eating and sleeping situation. Humans, even the earliest humans, have always covered themselves for protection and warmth. Even those who choose to go without garments cover when cold. Our ancestors who came from colder climates evolved. Today we must adapt. Modern humans aren’t cold-weather creatures. Since we’re curious and adventurous, we’ve had to create better clothing for extreme conditions. Our use of wool, furs and synthetics have improved throughout history, purely for the safety of those wearing it. Wool, cotton, leather, silk and furs absorb moisture, become heavy when wet and do not breathe well. 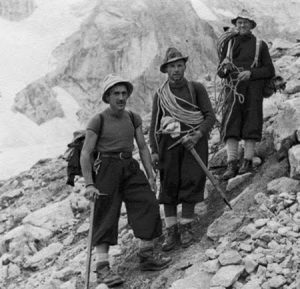 For explorers and mountaineers, these natural fabrics became dangerous because they’d freeze. Also, the first wool garments were rough, itchy and uncomfortable. The 1970s was a thriving time for innovations in the outdoor clothing industry due to the inventions of synthetic materials that mimic wool with improved moisture-wicking capabilities. Synthetic materials like Gore-Tex and polypropylene wick moisture away from the skin by allowing vapor to pass through and a fine mesh provide insulation from the cold. Climbers then began understanding how layers help retain heat yet allow humidity and moisture to evaporate so skin stays dry. Patagonia was the first outdoor clothing company to heavily market the layering concept it by educating customers through booklets. Why is it so important to stay dry? Because being wet will speed up the process of hypothermia. Gore-Tex revolutionized the waterproof outer layer due to its lightweight and breathability. In 1969, inventor and scientist Bob Gore was stretching PTFE (Teflon) and discovered that it turned into a thin, porous sheet forming a membrane that stops water but also allows water vapor to pass through. The first clothing made from this material went on sale in 1976 by the Early Winters company. 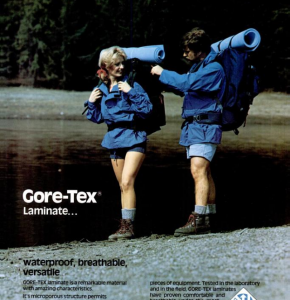 Gore-Tex is still used today in outdoor clothing. In fact, many of the first pioneers of outdoor clothing like Patagonia, Eddie Bauer, Columbia and The North Face still produce their original outdoor pieces. 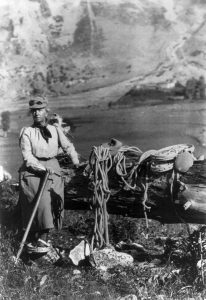 Fanny Bullock Workman was one of the first women professional mountaineers. She’d climb in skirts and set many women’s altitude records. Proper outdoor clothing keeps you safe by staying warm and dry, as well as prevents sunburn, bug bites and run-ins with poison ivy. Outdoor clothing companies put a lot of serious thought into the science behind high-performance, high-tech advanced fabrics to aid in regulating your body temperature. While fit, feel and function are the top priorities when it comes to outdoor clothing, most reputable brands also understand the fashion behind their clothing designs. Because of this, quality outdoor clothing isn’t cheap. You pay premium prices for the biggest names in outdoor gear like The North Face, Patagonia and Columbia. The higher price tags are worth it, though. Outdoor clothes must be warm, comfortable, flexible, as well as extremely durable. You don’t want your outdoor clothes to rip and tear or stain easily. Inevitably, even on the laziest of camping trips, your hiking clothes will get dirty and though you can expect to get dirty, you want your camping and hiking clothes to be easy to maintain. Before throwing down hundreds of dollars’ worth of high-end base and outer layers, it is important to note the where and when you’ll be doing your hiking and camping. Spring campers in the Pacific Northwest, Arizona campers in the summer and Coloradans winter campers’ packing checklist will vary greatly. Mountains, lakes, beaches and deserts all have their own microclimates, so make sure are you familiar with the fluctuations in temperatures through the day and night. It is always safest to dress in layers. Be ready for anything, even if the weather forecast is clear! Most outdoor clothing companies, like Eddie Bauer, make high-performance clothing, as well as casual camping clothes. Always pack an extra pair of clothing in case one set of clothes gets wet, you always have something dry to change into. Hang wet clothes out to dry completely before putting them back on. This is especially important for your socks, base layer and pajamas. Even though cotton is soft and comfortable, all outdoor-experts know to avoid it. It will not absorb moisture! In the summer, a cotton t-shirt or tank top is fine, however, can get stinky. When considering what clothes to take with you camping in the fall, spring or winter, stick to the layering idea. Your base layer, like long underwear, needs to keep you dry, your middle layer helps keep you insulated, and your outer layer is for waterproofing. You can even throw a fourth layer in there between your core layer and your outer layer—for example, a hoodie over your t-shirt and a coat or rain jacket over that. For all seasons, for all areas, here are the Best in Bunch editor’s favorite camping and hiking clothes. Many brands now understand that outdoor clothes not only need to be functional but Instagram-worthy, as well. So, included in this list is the quintessential outdoor gear—a down puffer jacket, fuzzy fleece and a red plaid flannel shirt. For all seasons, for all areas, here are the Best in Bunch editors’ favorite camping and hiking clothes. These Teva classic sandals with a fashionable twist are a river rat’s BFF. This summer adventure shoe of choice is so versatile, it easily transitions between brunch to the tube for an afternoon float down the river. Next weekend, it’s the beach and lunch with the squad! They equally work well for waterparks, too. Anywhere you don’t want to be barefoot but also be comfortable, the Teva sandal works better than flip-flops. The Velcro straps don’t come loose so you need not to worry about losing your shoes, even with the harshest waves, tube shoots or water rides. Designed by a Grand Canyon river guide, Teva sandals—both for men and women—are super comfortable, dry quickly and retain their shape. This is one sport water shoe you won’t regret investing in. The original universal Teva sandal features a cushioned footbed, rubber outer and polyester webbing. These Bearpaw snow boots are constructed of a real cowhide suede upper, a wool-blend lining and a sheepskin footbed. The materials naturally keep your foot warm. The outside is treated with Neverwet technology, a water-repellent finish that helps keep your boots from staining and keep your feet dry. The Bearpaw boots can be worn with or without socks and are super comfortable for everyday wear around in the house and around town. A hardened, real rubber sole means you can walk on any type of ground from gravel to dirt, mud and snow. They come in a variety of colors and don’t cost as much as the other brand, are just as comfortable and warm and due to the Neverwet finish, are easy to keep clean. Vegan varieties are also available. The Skyliner down jacket from Eddie Bauer is a throwback to the original Eddie Bauer jacket and the company’s first product born from necessity. Eddie Bauer, while hauling 100 pounds of fish, was hiking back to his car a mile away from his honey hole on the Skokomish River in Washington in frigid, snowy conditions. Bauer began sweating and overheating from the exertion of the hike. He removed his outer wool shell. By the time he reached the 300-foot climb out of the river canyon, his cotton long underwear was soaked through and frozen. Bauer nearly suffered from hypothermia. After returning from the fishing trip, he experimented with making a coat filled with down. In 1938, Bauer founded the Arctic Feather & Down Company to make his jackets. Skyliner jackets provide warmth, are lightweight and breathable. Not only do climbers, skiers, hunters and fisherman appreciate them, but linemen, miners, ranchers and field workers wear them for the same features, plus its durability. Constructed of 56-percent cotton and 44-percent nylon, the original Skyline is filled with 650 fill down and has a classic bomber-style cut which fits mid-way between fitted and relaxed. It features a rib-knit collar, cuffs and hem. The Skyline was the very first down jacket to be patented in America and is still popular today. Down keeps you toasty warm in extreme, dry cold conditions. This jacket is rated to -15 degrees Fahrenheit. Poplar not just with hikers and climbers, The North Face’s retro Nuptse puffer jacket is an original 1996 design. Today’s version is made with 700-fill goose down with an outer baffle construction made of water-resistant nylon ripstop fabric—keeping you warm and dry out in the woods and in the city. It features cinch cords at the hem to block wind, internal elastic-bound cuffs and a lining around the collar. You’ll see The North Face puffer jacket on everyone from extreme sports athletes to influencers and celebrities. The coats come in both men and women’s cuts, short and longer lengths with a relaxed, boxy fit and a lifetime warranty. They are also perfect for backpacking, camping, hiking and travel as they are highly compressible to save space in your pack. The ultimate outdoors top perfect for camping, hiking, hunting, fishing and gardening, this long-sleeved nylon shirt from Eddie Bauer is impregnated with insect repellent to keep off ticks and mosquitos. It is machine-washable. It even offers FeeShade UPF 50+ sun protection. A side zippered pocket will hold your phone, chemical hand warmers and other small items. Though cut for a woman, it does have a roomier fit, so movement is unrestricted. Icebreaker is a company based on sustainability. The founder wanted to create an outdoor clothing brand which took advantage of the natural characteristics of merino wool yet innovate with tech fabrics. Its base layers are soft, warm and fit perfectly. Icebreaker has integrated wool with other fabrics to create lightweight, wearable outdoor and athletic clothing from base to outer layers. A close-fit without being restrictive, we particularly like the odor-control and how warm they keep you even in extremely cold temperatures. The base layers come in different weights—from very cold to summer. All weights offer the perfect combination of warmth with breathability. Talk about cozy! This classic North Face fleece is super soft and fluffy for the coldest evenings around the campfire. Constructed of 100% polyester, this North Face jacket has a tailored waist for a stylish fit, comfortable stretch cuffs and hem that don’t cut but also don’t allow cold air in. There are two zippered pockets. The bonus is that It comes in 28 different colors! Julbo sunglasses are the choice of extreme climbers, mountain trekkers, trail runners and mountain bikers. Julbo focuses on designing high-performance sporting sunglasses built tough with comfort and protection in mind. The Renegade is a more causal camper design which is still durable enough for sports, yet cool enough to wear out. They are on the lower-end of Julbo’s price range. The polycarbonate lens is scratch- and shock-resistant, as well as lightweight. The temples feature a secure grip and comfort points. The nose bridge is soft and flexible but stays put. The wraparound design offers full protection. We particularly love these pants for fall and spring when the temperatures fluctuate. The legs easily zip off and convert into shorts. Constructed of 100-percent nylon ripstop, Omni-Wick mesh and polyester, the Columbia Silver Ridge pant is highly water-resistant as well as moisture-wicking. Sweat evaporates off, keeping you cool and dry. There is also UPF 50 sun protection build in. An elastic waistband makes these comfortable to wear, especially during activities like hiking or trail running. There are plenty of Velcro pockets for all your essentials. Our favorite part about these pants is how lightweight they are. They are flexible and breathable and are versatile for warmer months. Order a size up for the perfect not too loose, not too tight fit. For those of you who like to lumberjack on the weekends, this plaid shirt is perfect for fall or spring when the weather is unpredictable. Better on dry days, it makes cooler weather tolerable over a t-shirt. The Sherpa lining inside keeps you warm and the relaxed fit doesn’t restrict any movement when gathering firewood or grilling. The sleeves are padded with a quilt-like lining and the cuffs button to keep the wind out. When the temperatures drop, you still have plenty of room to add a coat over it. It’s soft and comfortable and perfect for casual camping, leisure hikes and just hanging out around the campfire. Remember when Snuggies came out and we all made fun of them, but then you got one for a gift and it actually became your favorite fall and winter lounge item? Well, these are sort of the same thing, except warmer and they cover better. Do they look silly? Absolutely, but you won’t care once you slip one on. The Comfy oversized hoodie sweatshirt is Sherpa-lined in extremely soft fabric and keeps you cozy and warm when sitting outside on a chilly night by the campfire. When sitting down, there is ample room to curl up your feet and be completely covered. The original Comfy (as featured on Shark Tank) is soft, washable, reversible and one-size fits all. There is a pocket that will hold your phone, keep your hands warm and will even fit a small dog—yes, we tested this! 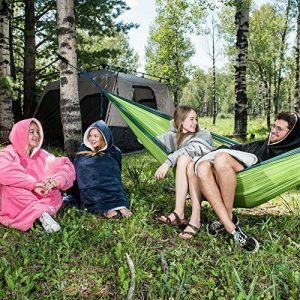 From tailgate parties to sporting events to movie night on the couch, the Comfy won’t be just your favorite fall camping item, it will be something you’ll live in once the weather turns cooler. When backpacking and hiking, don’t carry any more than 25% of your body weight. Be thoughtful about weight when picking out and packing your camping outfits. Consider your activity level. The more strenuous the activity level, the more you will sweat, even when it’s cold. If you will be doing a lot of walking, jogging, hiking, running or chopping wood, you will want to wear an underlayer or base layer of good moisture-wicking fabric. If any piece of clothing gets wet, change clothes and hang it to dry. Always go to bed in completely dry clothing. Sleeping in a wood beanie will help keep you warm. What are your favorite clothing items to take camping? Share with us in the comment section. If you are looking for what shoes to wear camping, check out our post about the best hiking boots and shoes by clicking here.